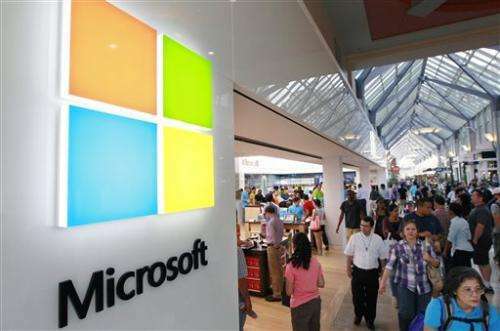 (AP)—Microsoft is trying to reverse slumping PC sales and quiet growing criticism of its flagship operating system with the release of a revised version of Windows 8. On Wednesday, Microsoft made a preview version of Windows 8.1 available for download. It includes alterations meant to address consumer dissatisfaction with the operating system. Analysts believe users' frustration with Windows 8 is partly to blame for the biggest drop in personal computer sales in nearly two decades. At a conference in San Francisco, Microsoft CEO Steve Ballmer acknowledged that the company pushed hard to get people to adopt a radical new tile-based "Modern" user interface in Windows 8. Microsoft is now back-pedaling, making it easier to reach and use the older "Desktop" interface. "Let's make it easier to start applications the way we're used to," Ballmer told the audience of software developers. "What we will show you today is a refined blend of our Desktop experience and our Modern experience." Windows 8, released Oct. 26, was Microsoft's answer to changing customer behavior and the rise of tablet computers. The operating system emphasizes touch controls over the mouse and the keyboard, which had been the main way people have interacted with their personal computers since the 1980s. Microsoft and PC makers had been looking to Windows 8 to revive sales of personal computers, but some people have been put off by the radical makeover. Research firm IDC said the operating system actually slowed down the market. Although Microsoft says it has sold more than 100 million Windows 8 licenses so far, IDC said worldwide shipments of personal computers fell 14 percent in the first three months of this year, the worst since tracking began in 1994. Windows 8 was also supposed to make Microsoft more competitive in the growing market for tablet computers. But Windows tablets had less than a 4 percent market share in the first quarter, compared with 57 percent for Android and 40 percent for Apple's iPad. Among the changes present in Windows 8.1, users will be able to boot up in Desktop mode. There, they'll find a button that resembles the old Start button. It won't take users to the old Start menu, but to the new Modern Windows 8 start screen. Still, the re-introduction of the familiar button may make it easier for longtime Windows users to get accustomed to the changes. A common complaint about Windows 8 is that it hides features and functions, and replaces buttons with gestures and invisible click zones that have to be memorized. Now, a single swipe up from the Modern start screen brings up all programs, even those that are seldom used. Other new features of Windows 8.1 include more options to use multiple apps. People will be able to determine how much of the screen each app takes while showing up to four different programs, rather than just two. The update will also offer more integrated search results, showing users previews of websites, apps and documents that are on the device, all at once. Microsoft also touted a broadening array of applications specifically written for Windows 8, among them one from Facebook. Frank Gillett, an analyst with research firm Forrester, said that with 8.1, Microsoft is doing a better job of uniting the Desktop and Modern screens, but the changes don't run deep. "They smoothed off some rough edges, but they don't fundamentally change the experience of having two experiences within one operating system," he said. One big problem is the fact that Windows 8 doesn't work well on smaller screens, making Windows tablets less competitive with cheaper tablets such as Apple's iPad Mini, Google's Nexus 7 and Amazon's Kindle Fire HD. Microsoft is addressing that shift by banking its future on touch controls—but it also unveiled new functions for giving computers voice commands and using a device's camera to recognize simple gestures such as swipes in mid-air. Its strategy calls for having just one operating system work on both tablets and traditional computers. That allows popular Windows programs such as Office to work well on tablets, too. But in emphasizing these new interfaces, mouse and keyboard commands are more complex to use and figure out. Apple and Google, on the other hand, believe people use those machines differently and have opted to keep their operating systems separate. Apple, for instance, believes that it can be tiresome to have to constantly move your arm to touch a desktop or laptop screen. That's not a problem with tablets because you're already holding it. Microsoft also said very little about Windows RT, the Windows 8 variant that's designed to run on the same phone-style processors that let the iPad and Android tablets be lighter and have longer battery lives than Windows 8 tablets with PC-style Intel processors. Windows RT has been hamstrung by a lack of applications, since it won't run older Windows programs. But Ballmer said there will be 100,000 apps that run on all newer versions of Windows by the end of the month. And a new line of Intel processors code-named "Haswell" are expected to greatly improve battery life without sacrificing processing power on mobile devices. Microsoft Corp. just cut the effective price of its Surface tablet with Windows RT by including a keyboard cover for free. The cover sells for $120 or $130 on its own. Microsoft also said this month that it would give buyers of the RT version of Surface the Outlook email and calendar program at no extra charge—joining other Office freebies Excel, Word and Power Point—and sweetening the offer for the device that is priced starting at $499. The new programs will come as part of the Windows 8.1 update. Yay, another version of Window$ that I'm not going to buy. Very happy since I switched to Linux. How do you confuse a Windows user and ruin their day? Take away the 'START' button. I hope the new button will have 'START' on it otherwise it will be the end of computing as we know it. If the PC market is reliant on Microsoft producing a usable operating system, then time to get rid of the Windows tax and allow PCs to be shipped without an operating system.